CCS isn’t the only theological centre with an anniverary this year. Five Oaks Centre is celebrating its 60th! And to mark the occasion they’ve published o book of memories, “Seasons at the Centre”. A number of CCS friends have contributed to the book, including Diane Trollope, Wilda Bostwick, Gwyn Griffith, Ted Dodd. CCS grad Debra Kigar is a co-editor of the book. “Three years ago (2009, the year in which I retired from employment at McMaster University AND the year I graduated with my B.A. in Religious Studies from Mac), I was approached by Andrea Buttars and Mardi Tindal about the possibility of co-editing a book to celebrate Five Oaks’ 60th anniversary. My co-editor Adam Mason was also approached. Since we had both worked very well together in leadership at Five Oaks Family Camps, and because we both have great love for Five Oaks, we said YES! I figured I had all the time in the world since the only thing I was doing was studying at CCS! What I didn’t know was that during the final critical proofreading and printing stage of the book, I was to be far away on the East Coast of Quebec! 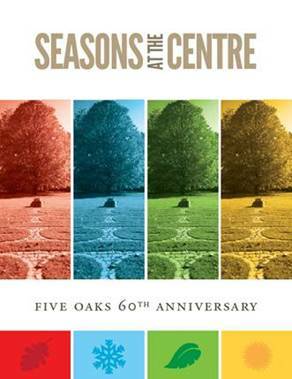 Since 2009 there has been a great deal of activity which has culminated in “Seasons at the Centre” – the book was launched at an event at Five Oaks on Saturday May 12th. Unfortunately, I did not make it to the launch (although my co-editor did) – but that’s a different story. The story of this book is one of great response, great love and great memories of the Centre. When Adam and I put out the call for contributors they began to pour in. The contributions are as many and varied as the contributors – over 70 of them who sent in poetry, anecdotes, short stories, artwork, photographs, prayers, and songs. Every contribution is gathered into one of 4 seasons – and each season is introduced with an aboriginal prayer. I am humbled by the richness and beauty that contributors were willing to share with us. I know that anyone who purchases this book will experience that richness and that beauty.